Earlier today we brought you a list of five Nintendo games to thrill you in 2011, but one big name was absent: Legend of Zelda: Skyward Sword, as it wasn't really fair to put arguably this year's biggest title against anything else. 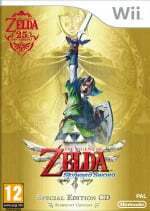 Link's previous adventure on Wii, Legend of Zelda: Twilight Princess, was never developed with Wii in mind, having been designed as GameCube's swansong. 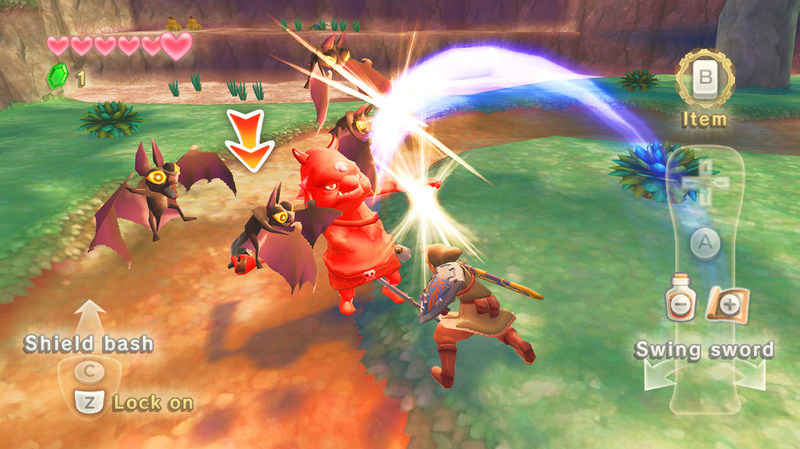 Skyward Sword, on the other hand, is set to make far better use of the Wii's unique abilities than its predecessor. Requiring either MotionPlus or the new Wii Remote Plus accessory, Nintendo is promising more control over Link's actions than ever before. The E3 demonstration showed off familiar items - a bow-and-arrow, bombs and swordplay - but it's the new items that always intrigue in new Zelda titles. Link will have access to a whip and a new flying beetle that seeks out new areas and items, all controlled with the extra accuracy afforded by MotionPlus. Taking a graphical style that's billed as "a watercolour painting come to life", the game blends visual elements from other Link's previous adventures. While not quite as strongly cartoon-styled as Zelda: Wind Waker, it's certainly a change from the dusky visuals of Twilight Princess, which may or may not be a good thing depending on your point of view. We played Legend of Zelda: Skyward Sword at E3 in 2010 and we'll have more news and previews in the coming months before its release. Everytime i see a new up date for this , it seems like forever ago that we've heard about it coming out. I think the serious realistic look is more to my liking. Twilight look was great. This WILL be game of the year in 2011. Twilight Princess was fantastic. Wind Waker was fantastic. Add the two together and throw in subtle elements from other Zelda games and new stuff and you have a big-time winner. Personally I think this looks great. I enjoyed Twilight Princess the first time around (when I didn't have thousands of other games to play) but every time I've gone back to it since I've not been able to get into it. This, however, I expect to keep me busy for a very long time, as long as there's no other games released within a three month period surrounding this one. I am eagerly looking forward to this one. Kind of a short article for the year's biggest game, haha. I frankly haven't seen enough to really get hyped for this. The art style is fantastic, yes, but so far the scope of the game seems very small. I'd like to see how large the (hopefully open) world will be, know how many dungeons there'll be, see how much variety they can cram in, and know if they'll do anything REALLY creative. After being nearly killed with boredom by Twilight Princess, I definitely don't want more of the same. @pixelman Year's biggest game about which we actually don't know a whole lot at the mo :3 Secrecy is good! Loved it when I played it and I can't wait to sit down with this one upon release. Should be amazing! I got Twilight Princess back when I got my Wii but I just couldnt get into it and gave it to my friend for his birthday. I am thinking of maybe giving it another shot but should I go with the Wii version or the Gamecube? This game looks great, but I'd better hurry up and finish Twilight Princess first! I don't see how it's 2011's biggest game, and yet its not one of the 5 games on the NL radar? Can't wait! I can't tell you how many times I've played through Twilight Princess and Wind Waker, so it's great to see a game that blends the best of both worlds. Try reading the first sentence of this article then. Glad I could help! This only gets better and better! I hope they make ALOT of extra stuff to the land, like zelda 1 but way bigger. Only thing holding me back very minimally is a Lefthanded mode. We lefties need options. Come on, Nintendo. its just a 2nd Link model. you can do it. I only hope Ninty doesn't screw things up. They got a lot to live up to after all. I'm excited for this game, but I hate the art style, I liked TP's art style way better. So this really comes in 2011.. must've remebered wrong. Hopefully nintendo doesn't screw this up like they did with TP, PH and ST at least the graphics are colorful once again. Some Majora's Mask style sidequests would be welcome. When I get this game I'll feel like six year old me making bada** toy lightsaber moves. This is my dream game! This game will be good when it comes out but I don't know if it will be on the scale we want. Since E3 I have not been hyped for this game. And that is serious weird for me. But the stage showing of it put me off. Sure it may have been a technical glitch or something and others at E3 who played the game said it worked fine but that stage showing plus the 3ds killed my hype and some of my hope for this game. Hopefully though Nintendo rights the wrong of last year and make this the game of the year. Majora's mask is currently my fave zelda game with, wind waker in second. I wonder if this will be able to beat either of them. twilights look was good, but it made it to realistic. It felt to reel. This looks good. Its like a totem in inception. it lets me know it isnt real life. What is it with people not reading the first sentence of the articles? I think N-life needs to make them more interesting so that they can grab the reader's attentions!!! In that case, nintendos in trouble. Motion controls made twilight princess wii a much less fun experience than the gamecube version. And now they're being forced? Ugh. Then they drop the art style for something that looks, again, no better than a gamecube game. We know nintendo can do far better, as marios recent 3d outings show, but zelda doesn't seem to be worth the effort. So yeah, I'm expected SS to fall on the "play once. forget about forever" heap alongside the DS games and windwaker. This might be the first 3D Zelda I'll truly enjoy. I feel like with every one thing they get right, there's something else that feels like a bummer. The art style is growing on me FAST. But it's like- they do nothing with it. We've already seen these designs and looks - such as the forest and trails and these enemies, and mountains. One must wonder if 'innovation' has become synonymous with 'ye old routine' at their offices. Cos that would be a shame. I can't wait for this. I'm taking a break from Video Games after the 3DS so I hope it comes out in November or December. BTW, the whip isn't new. It was in Spirit Tracks. I can't wait for this game! The art style is beautiful and the swordplay should make the game super-exciting. It shouldn't disappoint. I know we have basically another year to go since it's a Christmas release, but I cannot wait to play this game. can't wait for this game, i am a self diagnosed zelda addict. whew, I thought they thought this game was going to come out in 2012 or something. I feel better now. Looks promising, but I hope they change the name. @CowLaunch trust me, by the time you finish the game you'll be thinking that the name couldn't have been better. somewhere, the name will pop up as a symbol (kinda like Phantom Hourglass and Twilight Princess, if you're getting my drift). I just hope it isn't as lame as Twilight Princess was. I'm not so sure about this game really. They might just go overboard with the motion controls. I don't think I'll mind using it for the swordplay (since it’s not just waggling this time), or items it just works for (bow etc. ).BUT not too happy about the whipping and god-awful moves they have planned for using bombs... this Zelda could end up being gimmick ridden. I wish they'd focus more on the content rather than attaching weird movements to every existing/new item. Seems too late now though. I like how colorful it is, and the Wii motion plus will really make you feel like you're.....well...Link! Very excited about the game, not to excited about the waiting. I actually didn't like the new art style at first, but I read in a developer interview that it was intended to compliment the swordfighting better. Wind Waker's art style wouldn't work as well because players would have a hard time connecting their own movements with those of a stubby-armed, huge-headed kid. The grittier look of Twilight Princess would make it too difficult to make enemies' weak points stand out (without just making them all exceptionally disgusting ). From that standpoint, it seems to me like this style is the best fit for the game after all. I just hope it's not as dreadfully boring as Twilight Princess. I'll be GameFly'ing this one first just to make sure. Skyward Sword IS 2011. All else pales in comparison, even life itself. This is the perfect example of how I dreamed a 3D Zelda game should look like, it's simply beautiful, colorful and other worldy. And the motionplus controls will no doubt be amazing, making this the greatest, most enganging and intuitive 3D Zelda yet! @35.Dragoon: You havn't liked any of the other 3D Zelda games, then I highly doubt this game will change that. The art style looks like a fairy tale. After playing Ocarina of Time and Twilight Princess (and even Wind Waker) the art style just does not seem to fit the overall tone of most Zelda games: A slight feeling of impending destruction from none other than Ganondorf. I personally love the art style. It reminds me of A Link to the Past with the simple yet colorful look and all. I hope it's more like Twilight Princess than Wind Waker, which bores me to death these days. But seriously, i hope it would be more like the first Zelda. I'm looking forward to it, but it's hard to get too excited because I don't know too much about it. Wasn't impressed with what I saw at E3. I'm sure it'll be good, but it just looked to be the same old same old. I obviously want o be wrong of course, and I'm sure it'll be great regardless but I dunno about game of the year. Again, I want to be wrong. This is their chance to really nail motion controls and prove that it can be viable in a AAA game. Since motion controls are the main selling point of the Wii, I'd go as far as to say this will be the most important Wii release since launch. i'm not a massive fan of either style of graphics that they use for zelda. Twilight princess looks pretty bland and cliché, and this looks too bright and happy for the mood of the game. I think they could use this more illustrated look but mute the colours a bit, make it more contrasty and give the game a bit of a re-design to make it more interesting looking. Biggest game on any system in all probability. What's with all the Twilight Princess hate? GIMME GIMME GIMME!!! Give me Skyward Sword NAO! Twilight Princess and Wind Waker were both boring. I didn't say it first. "What's with all the Twilight Princess hate?" Because it's cool to hate it. Granted, it was the least original of the 3D Zeldas and the darker stuff could be forced at times but the hate for it is silly and no one has ever given a legit reason for it compared to other zeldas. At least I'm not the only one being cautious about this one. Also, I can't believe it, but I actually agree with kkslider regarding Twilight Princess. Wind Waker definitly had it's share of boring parts, but it also had moments of greatness yet they were few and far between. the Visuals were eye popping and gorgeous, but the crazy endless and boring Sailing, the annoying characters, the tame difficulty, and the unimpressive and annoying score tempted me to turn the game off more times than I can remember. Overall it was great to look at, but painfully boring more than half the time. It's easily my least favorite Zelda game that I've ever played. I had a much better time with PHG, but that's basically because of the genious and amazing touch screen controls which added ALOT to the experience. Bland Dungeons? check! unappealing 3D visuals? Check! Amazing, intuitive and brilliant touch screen controls coupled by an extra screen? Check! 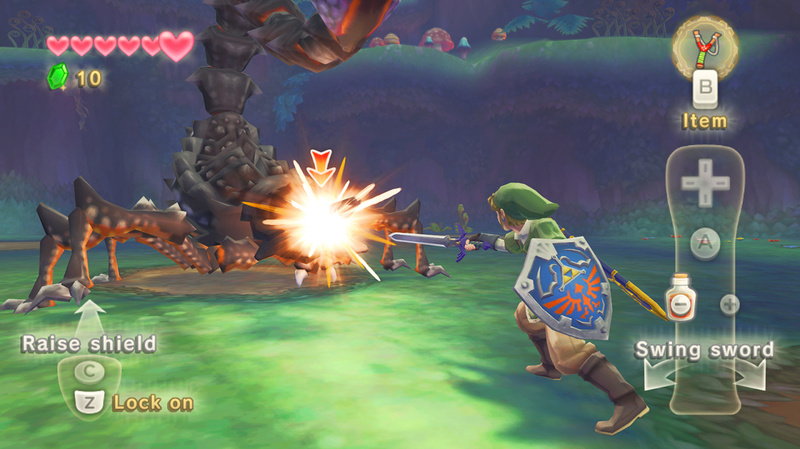 As for Skyward sword, this is the 3D zelda I've always dreamed about. It's like ALTTP has gone 3D and more, it's perfect in my eyes, colorful, storybook-like and dreamy surreal. And the motionplus controls will make previous Zelda games feel boring and archiac from a gameplay perspective, can't wait! Most Importantly Gameplay: I can deal w/ Wii-centric controls as long as it's done right. Meaning responsive, not jerky, or inaccurate, & just the right amount of precision movement, so I don't have to worry about scratching my nose, or something like taking a drink of soda during paused/unpaused gameplay, yet it's not too difficult to get Link to walk/run a specific direction, or attack a certain enemy a certain way. Hopefully the lock-on, & items won't be jerky, either. Graphics: Reminds me of the colors used on the sprinkles on Little Debbie Cosmic Brownies(which I could go for right now. ), & Kool-Aid colors(like the blue rupee in 1 of the screenshots). I like the coloring, but some of the models in the srceens(screenshots) appear to have a/the Super Mario Sunshine-plastic look about them. I think this is due to the lighting Nintendo used in the art style. I haven't played 3d Zeldas, aside from Ocarina. But that's been due to money. So for me, even if this recycles some, or all MM/WW/TP/PH/ST ideas, it'll be somewhat (pretty/possibly) fresh to me. As for anything else, like story, & whatnot, we will just have to wait & see what develops. The graphics look like Gamecube graphics. And I mean that in a good way. I feel like people are worrying a little too much. As long as you have fun with the game, who cares about the general consensus about it's quality? No matter how most people think this game is when it releases, it's going to be fun to play to many people. After all, Nintendo doesn't take it's killer franchises lightly. ONly one error in this article. it says: "...of 2011"
Miyamoto-san said a few weeks ago that they were only halfway done with it. @Golgo That could simply mean just half the territory/dungeons is left to complete. I can easily see building character rigging/fine tuning controls/attaining new abilities/creating the enemies (which we've already seen finished via E3) being just as much work! I don't care if they change the art direction if they finally get us a good new Story that can compete with Ocarina of Time. Actually, I think the new style is really nice and fresh -- they can make something out of it! WAAAA I Want This Game Right Now!!!!!!!!!!!!!!!!!!!!!!! I have to find a way to make money for this. No, not a job. I'm too young. Dang. Firstly, I'd just like to say that I'm not sure why some people are dissing TP. I understand it was a huge departure in the series but really, the graphics and storyline were unlike any other Zelda game. Perhaps it was that they removed too many of the styles and things we loved. That being said, I wish they would make more realistic games like Twilight Princess and still sometimes release games in other styles. It makes for a nice variety and attracts more people to the series. However, I am VERY disappointed in Nintendo. They have already announced the new Wii system that is supposed to release in 2012.. why then do I HAVE to buy a Wii MotionPlus or the new Wii Remote Plus accessory? Especially since I will be buying one of the new systems... seems like Nintendo is taking advantage of Wii users. I don't like it. And the sad thing is, that is why I loved Nintendo, better prices, I like the series they have and they've not really pulled many, if any, dirty moves. Bad move Nintendo. Maybe I'll cancel my pre-order. I don't know, I hope E3 shows something epic because Twilight Princess' story progression and graphics are going to be hard to beat, although I do wish they had been more consistent with the light/dark world story. I think it was confusing to call it the twilight in TP. Other than that, no complaints here.